Even though black isn't the most flattering colour for everyone - it is very easy to buy because there is so much choice available. It can feel like a 'safe' option, or you may have to wear it for work, or you may just have some great black pieces in your wardrobe that you need to keep wearing. Make-up is a must, in your most flattering shades, to 'lift' the draining effect black can have. Then use your best colours to accessorise or break up the black. What you wear near to your face is the most important, so colour in scarves, necklaces or a camisole under your top will help. When you know which of the six 'Dominant' colour palettes you are (Deep, Light, Warm, Cool, Clear or Soft) you will know which colours suit you best. Here are some examples to give you some ideas - and they would work just as well with other dark neutrals, such as navy, brown, charcoal or damson. 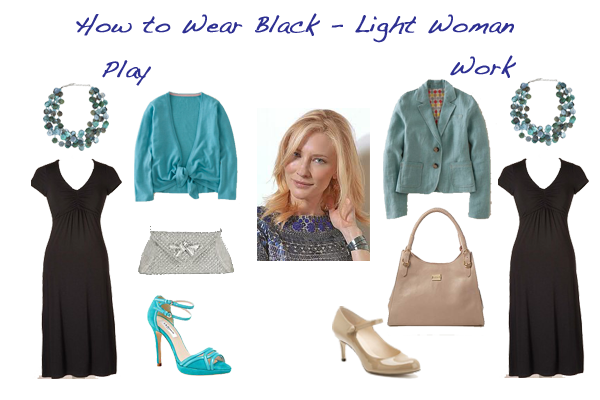 The Light Woman – try to keep the black as far from your face as possible. Wear a scarf or necklace in one of your best colours and add a coloured jacket in light aqua a blush pink or an apple green. Don’t make your lips too neutral or you will look washed out, wear a rose or light coral. The Deep Woman – You can wear black but you look good with combinations of rich strong colours, black on it’s own is boring so liven it up with a pop of red, true blue, or teal. Deeps are great in drama so wear your best red lipstick and nail varnish to make an entrance. The Warm Woman – brown is a much better neutral for you but if you do wear black this season is a bonus for you as there are plenty of warm earth colours in the shops. Wear your black with orange, yellow, rust and lime green. This seasons makeup colours have gorgeous golds, corals and greens to complement your golden colouring. The Cool Woman – You can wear black but you look best with contrast. So mix your black with pinks from baby to fuchsia, lavender, violet and light blue. Wear a great rose or fuchsia pink lipstick and keep your blusher pink rather than peach. The Clear Woman – Black could be a staple in your wardrobe, but like the cool woman you need contrast, so wear it with a bright or a light colour, there are plenty of brights around for you to try. You are the woman who needs a strong lipstick colour to highlight that contrast between your fair skin, dark hair and jewel like eyes. Why not try a bright purple eyeliner? The Soft Woman – Black isn’t great on you, your colours should be muted and blended so if you do wear black soften it with peach, beige or if you want to go for a colour blush pink or a soft violet or jade green. Wear blends of soft neutrals and make sure your lips are defined in a soft neutral brown beige or pink. This season has plenty for you with all the soft neutral tones which give such an expensive look.